Qu’est ce qu’un 5.5m JI? Posté dans 31 août, 2018 dans Régates 2018. 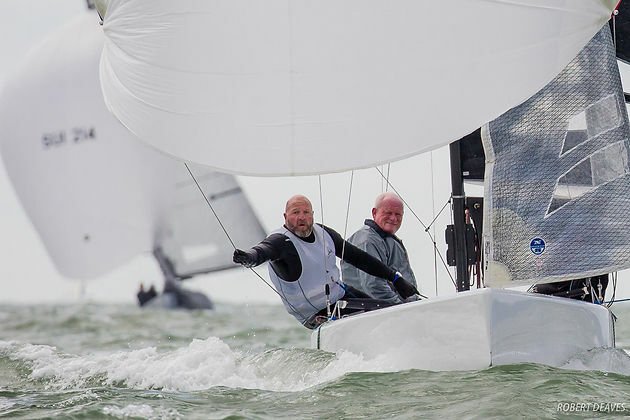 Marie-Françoise XIX, SUI 218, (Jürg Menzi, Jurgen Eiermann, Bo Selko) took the first race win in the Scandinavian Gold Cup in Cowes on Wednesday after a tough opening test of skills and stamina. 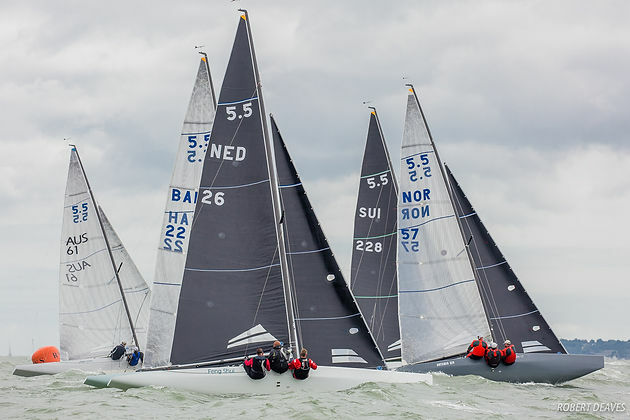 In an event where only the race win matters, Menzi battled throughout the race withArtemis XIV, NOR 57, (Kristian Nergaard, Johan Barne, Trond Solli-Saether), and beat his rival to the finish line by a couple of metres after 90 minutes of hard racing. 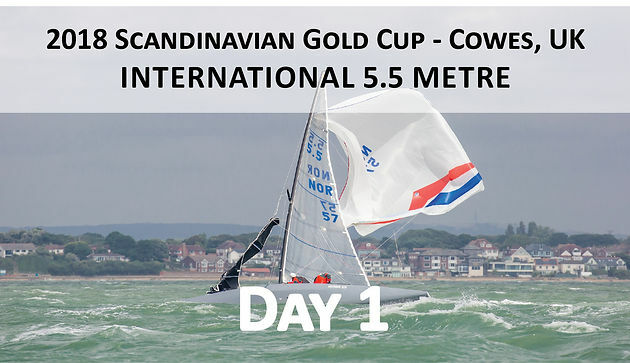 The Scandinavian Gold Cup pits ones boat from each nation against each other in a battle to win races. Only race wins matter and the first to three wins takes the historic 99-year old trophy. It is a hard trophy to win; consistency pays no dividends, only race wins gives overall victory. Marie-Françoise XIX is defending her win from last year, and is up against former world champion Nergaard, as well as defending world champion John B, BAH 22, (Gavin McKinney, Mathias Dahlman). 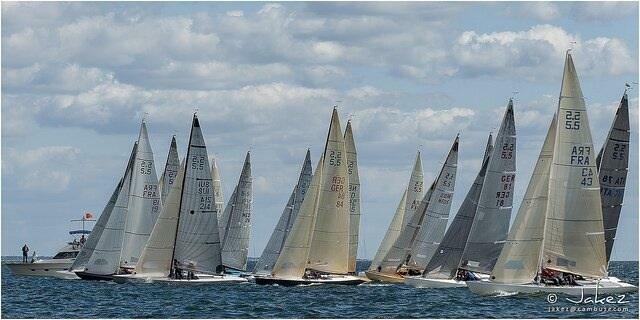 The race is a true test with three windward-leeward legs and an offwind finish. 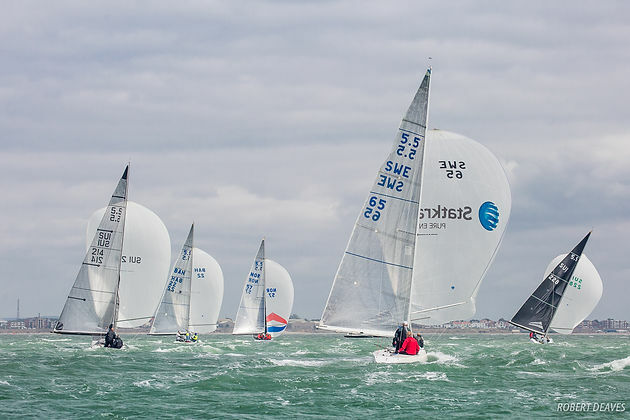 It was a largely grey day with a few moments of sunshine, but with 10-22 knots and a sharp chop running in the Solent, it was a tough start to two weeks of racing. Artemis XIV rounded the top mark with a narrow lead over John B and Marie-Françoise XIX, but the conditions got the better of the two world champions with Artemis XIV broaching twice and John B broaching once to let Marie-Françoise XIX escape. But the lead was short lived as Artemis XIV pulled right back and the two boats spent the next four legs almost locked together, battling for supremacy. They rounded the final top mark a few boatlengths apart, both hoisted spinnakers with twists, but Artemis XIV sorted hers first and soon the boats were overlapped, and would remain overlapped all the way to the finish. 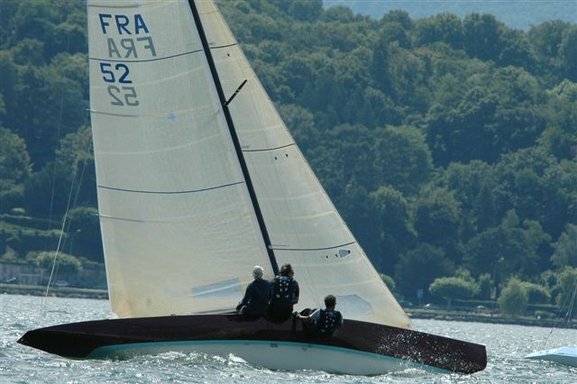 Artemis XIV had the inside track and pushed Marie-Françoise XIX high, away from the finish. The final gybe would decide who took the first win. It looked like they had gone to far and John B was fast approaching down the rhumb line. Eventually they both gybed together. Marie-Françoise XIX had problems setting her spinnaker and it looked like a win for Artemis XIV. But Menzi got his boat under control and had the better tide angle and they crossed the finish line, still overlapped, but with the bow of Marie-Françoise XIX a few metres forward of Artemis XIV. So the first win went to Menzi and his crew in one of the tightest finishes ever seen at the Gold Cup. Bowman on Marie-Françoise XIX, Bo Selko, said it was a tough day for the crews. Racing continues Thursday with two more races scheduled from 11.00, though an approaching storm front may delay proceedings. 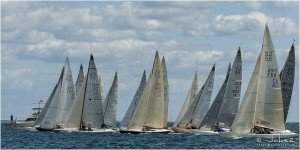 The Scandinavian Gold Cup fleet will also be joined by the Evolution and Classic fleets who will race for the Hankø Evolution Cup, the Royal Kaag Classic Cup. Pour des actualités « fraîchement salées »! 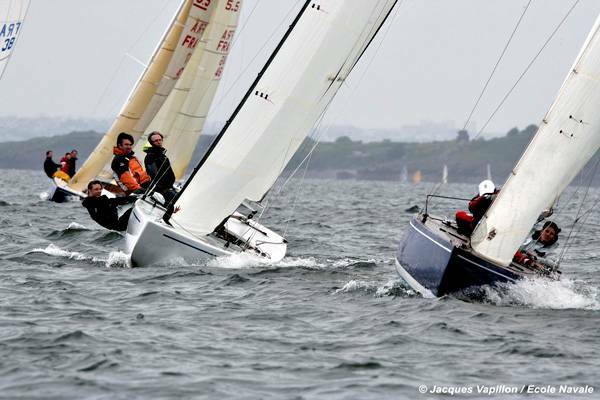 28/06/2012: Avant 2013... les championnats du monde 2012! 17/02/2014: Championnat du Monde 2014: hé oui, déjà!